I made it! About right in time! 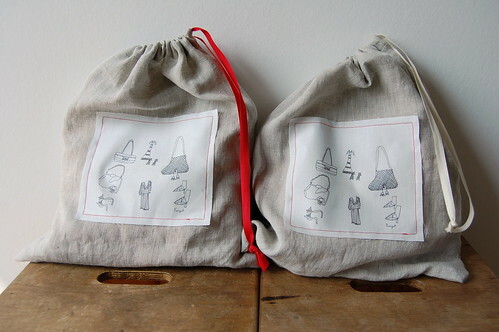 I just finished two more drawstring bags, for two of M.'s friends this time. These two are slightly different from the other one I made earlier this week - in that I didn't line them, but used a particular technique to finish them off nicely on the inside. If you're interested in finding out what it was that I did, you're lucky, as I plan to write down everything in a tutorial, hopefully somewhere next week. Need to go now as I still have a zillion things to get done before I'll go pick up the girls from school!